The main clinical applications of serum free light chain (sFLC) and Hevylite® (HLC) measurements are for patients with monoclonal gammopathies. Figure 12.1 shows the associated diseases seen at the Mayo Clinic in 2005 . 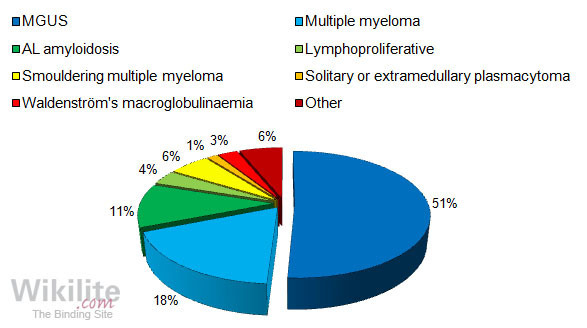 Since these data are from a specialist referral centre, general hospitals will probably see different patterns of disease referral with a higher percentage of multiple myeloma (MM) and monoclonal gammopathy of undetermined significance (MGUS) and fewer AL amyloidosis patients. This section presents an overview of the use of sFLC and HLC measurements in MM and related disorders; from pre-malignant MGUS and smouldering multiple myeloma (SMM), to the symptomatic disorders MM, plasmacytoma and plasma cell leukaemia.